Armitage Electrical is your Domestic Electrician providing electrical repairs, maintenance and installations services in North Brisbane. Looking for a reliable licensed electrician to install or repair an electric hot water system? Contact Armitage Electrical here today! If you’re looking to upgrade your switchboards – Armitage Electrical has the experience to do an upgrade on time and on budget. Installing a new pool with lighting requirements or want to add lighting to an existing pool? Armitage Electrical can help you! Armitage Electrical can help with your shed wiring requirements for any size shed. Read here what Shed Wiring services we provide. Armitage Electrical specialises in mains upgrades and ensures you have a safe power source for your property in North Brisbane. Armitage Electrical provides the highest quality domestic electrical services, maintenance or repairs for your home in North Brisbane. Contact Cameron today for a free quote! 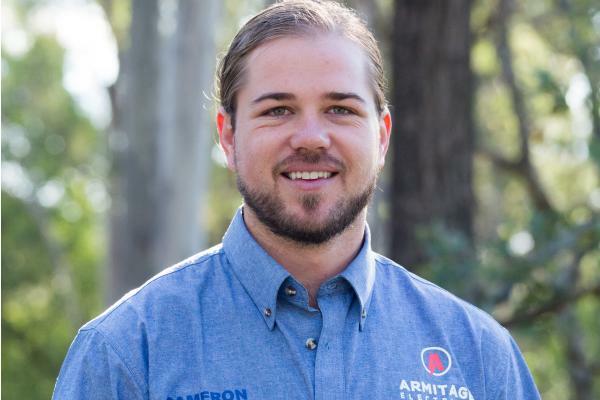 Cameron Armitage has 10 years’ experience as an Electrician. Cam’s approach is to deliver personable and trustworthy electrical services – whether you need a new hot water system, mains or switchboard upgrade, pool or shed wiring, or domestic services such as safe installation of powerpoints, lighting, downlights or ceiling fans – we can help! Unlike many other electricians – we’ll give you a realistic, all-inclusive price upfront including labor and materials so you know exactly what the job entails. We also prefer to jump on the phone and talk to you about exactly what your requirements are. We only recommend reputable brands that we know and trust – so you can be assured of a quality job. Armitage Electrical is a member of Artic and Master Electricians. Contact us today for a free, all-inclusive, upfront quote. All-inclusive upfront pricing. We’ll provide a competitive and realistic price upfront! NO call out fee! Our quotes are transparent quotes with all costs outlined! Very impressed with Cameron and his assistants in installing my air conditioner and also upgrading the switchboard and installing double outside power points. all work completed in a very neat and professional manner, all work areas cleaned up as they went and rubbish removed. Would recommend service as I believe was extremely well priced for what work was completed. I couldn't ask for a better electrical service.Cameron is efficient, on time, and very reasonably priced - every single time! Armitage Electiral is the only electrician I will be recommending from now on. Cameron is an honest, reliable, friendly and qualified professional. His workmanship is 10/10 and his service is second to none! Very courteous and more than helpful. Would highly recommend Armitage Electrical to anyone ....anywhere....anytime! Cameron’s worth 100 gold stars in my book and he will be getting all my work in the future! Thanks again Cameron. Cameron was punctual and provided quality service at a very competitive price. If anyone asked me to recommend an electrician Armitage Electrical would be the first, and only, company I would recommend. Cameron has completed a number of jobs for me at an old property I have just purchased which needed a number of electrical items checked and fixed. Installation of fans, exterior and interior lights, new power points etc. I felt completely comfortable to give Cameron access to the home without me being there. Trustworthy, reliable, capable and professional! I would not hesitate to recommend Armitage Electrical to any of my family or friends! Definitely 5 star service!